The ides of March were the start of a new routine for Scott Pruitt. At 7 a.m., before a trip with President Trump to Michigan, the U.S. EPA administrator met with other Cabinet members to talk about religion. A calendar entry shed light on the unusually early morning — "Bible study @ HHS with Cabinet." Politics were not supposed to be part of the discussion about Scripture, but they were not far removed from it, either, given Pruitt's likely company: Vice President Mike Pence and a handful of Cabinet secretaries. News that Pruitt, a Southern Baptist, was attending Bible study doesn't surprise those who know him. As an undergraduate, Pruitt attended Georgetown College, a Christian liberal arts school in Kentucky. He once went on a missionary trip to Romania. In Oklahoma, he played an active role in the First Baptist Church in Broken Arrow, where he served as a deacon and taught Sunday school. He was also on the board of trustees of the Southern Baptist Theological Seminary in Louisville, Ky. His Twitter biography as Oklahoma's attorney general read, "Husband, Father, Christ Follower." For Pruitt, his faith is a defining piece of his identity. Since Pruitt came to Washington, little attention has been paid to his evangelical faith and how it helps shape his decisions on the environment. Pruitt has not spoken publicly on the subject, but the views of religious leaders close to him could offer some clues. Meet Nick Garland, senior pastor at First Baptist Church. He's in his mid-60s, and he's known Pruitt for decades, since the EPA chief first enrolled in law school at the University of Tulsa. "He came with deep, deep convictions. His Christian training and strength has always been significant," said Garland. "He's not a wild-eyed weirdo. There are some weird ducks out there. Scott is a great student, he doesn't do anything on hearsay," he added. 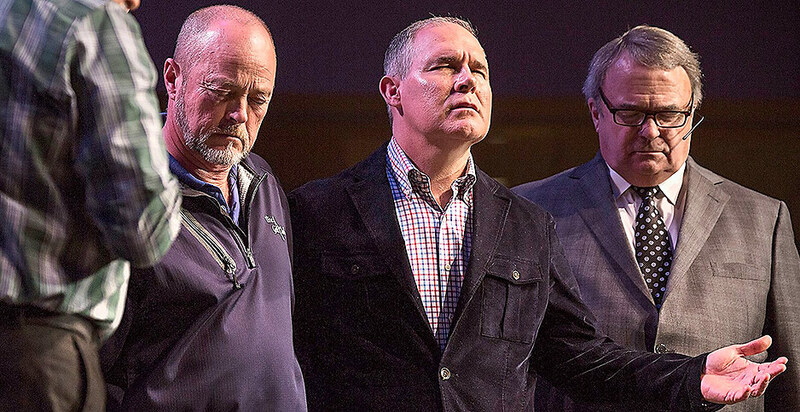 Garland has not discussed climate change or environmental stewardship with Pruitt specifically, he said, but the conservative congregation believes God created Earth. To understand the environment, Garland pointed to the creation story in the book of Genesis, where Adam and Eve meet in the Garden of Eden. For Garland, and many other Christians, it is this biblical text that lays out mankind's place in relation to the natural world. "In Genesis, he [God] put man in it to have dominion, he says [man] should work over it. Those are the mandates that he set not just for Adam but mankind. The word is to work and improve it and be God's steward of the Earth," Garland said. On climate change, Garland questioned whether it was wise for the public to "put its eggs in one basket." "I think the climate has always changed. Here's the dilemma, what really is the cause?" he said. Baptists are congregationalists, which means authority comes from the bottom up, rather than the top down, said Stephen Chapman, associate professor of the Old Testament at Duke University's Divinity School. "Local churches have a high degree of autonomy. They are in charge of electing their own pastors, and they have freedom to come to their own decisions about biblical interpretation and doctrine," Chapman said. These individual churches also have the freedom to align themselves with other churches. Pruitt's church is part of the Southern Baptist Convention, an older and more established group. Southern Baptists are the largest Protestant denomination in the country, and since the 1960s have become increasingly conservative, taking on a more literal reading of the Bible, according to Chapman. "Precisely because they don't have a pope, biblical interpretation becomes hugely important to Baptist life," Chapman said. "I think there are people in this nexus of beliefs, they would have a high view of divine sovereignty, and God would make sure the world wouldn't blow up. There is confidence that there is an 'end times' scenario that is preordained by God." Pruitt would have likely been exposed to a more moderate Baptist perspective during his time as an undergraduate at Georgetown College in Kentucky, according to Chapman's colleague, Curtis Freeman, director of the Baptist House of Studies at Duke Divinity School. Freeman said he knew the school's professors at the time Pruitt attended in the late 1980s. "The teachers at Georgetown were teaching more about the whole Bible as a story of human travail," Freeman said. Their approach would have framed damage to the environment as evidence of human sinfulness and that all people would face God's judgment for that harm, he said. "The hope is that God would allow us to redeem this and step into new creation," said Freeman. But Pruitt's reading of Scripture could have taken a more conservative and even apocalyptic bent once he reached Oklahoma to study law. More Southern Baptists had started following what had once been a fringe belief that the modern world would soon reach a catastrophic, fiery end, and God would then create a new Earth and heaven. "It's not just that the world is coming to an end; it's imminent. That's crazy thinking, and it's fueled all sorts of apocalyptical politics," Freeman said. "[Southern Baptists] are about as far as a denomination on the religious right as you can get; you really can't outflank them," he added. Some more progressive churches are focusing on caring for the planet, but those groups tend to be in the minority among Southern Baptists, said Marie Griffith, director of the John C. Danforth Center on Religion and Politics at Washington University in St. Louis. She was also brought up Southern Baptist. "The more common view is God is in charge, and so anything that happens is really God's divine plan, or at minimum, God allowed it to happen. God's in charge, so it's not for us to try and stop something," she said. "It's hard not to see so much of this as driven by self-interest. It allows you to, let's face it, be indifferent to the state of the planet," Griffith added. Since entering politics, first as an Oklahoma state senator and then as the state's attorney general, Pruitt had begun to take a less prominent role in his home church in Broken Arrow. But to Garland, the man he met at the beginning of his career continues to have a "missions heart." Garland recalled Pruitt's wife, Marlyn, working with children in the church, while Pruitt taught Sunday school. He would instruct church members how they could become involved in political and moral causes. "He seeks to do what he believes before God is right and spiritually right ... and not politically correct: Is it politically upright?" Garland said. These days, Garland doesn't see much of Pruitt, though Pruitt has returned to the church several times since he became EPA administrator, including to see his son Cade graduate from high school in May. Garland sees society today as a secular generation that has rejected divine design. He suggested the climate may only seem to be changing faster now because scientists are paying more attention to it. A lot of the data sets scientists use aren't even 50 years old. "There are things we don't yet understand," Garland said. He expressed regret that today's society seems to have little room for opposing voices and seeks to shut down ideas that don't fit with the mainstream. "Let's not make policy on just one side. Is there room for varying approaches?" Garland asked. On that point, Garland's views mirror Pruitt's. The administrator has said that although human activity does contribute to climate change, the extent of that impact is unsettled. One area of clarity is Pruitt's opinion on religion's impact on politics. In an October 2015 article published by the Southern Baptist Theological Seminary, where he was a trustee, Pruitt makes the case that liberals misinterpret the First Amendment of the Constitution by calling for a complete separation of church and state. Pruitt argues for a different reading of "Congress shall make no law respecting an establishment of religion, or prohibiting the free exercise thereof." "[The Founding Fathers] put those clauses next to one another seamlessly to achieve the same end: to ensure that government would be kept out of religion, not religion out of government," Pruitt said. Albert Mohler, president of the Southern Baptist Theological Seminary, has also made comments about climate change that in some ways echo Pruitt's views. In his podcast, "The Briefing," Mohler analyzes the news of the day through a Christian worldview. In one episode on March 30, he noted that while weather reporting over the past century has been extensive, the available data are not sufficient for understanding climate trends. He accused scientists of trying to retroactively create weather and climatological conditions to fit patterns and to demonstrate a future climate trajectory. "The problem is as I've said, those facts are by no means beyond dispute," Mohler said. Like Garland, he explained that God instructs mankind to have dominion over the planet and be a steward of it. "The dominion command that is found in Scripture ... is the command that human beings are to make a difference on the planet; we are to make a difference by subduing the planet in order to aid in human flourishing," he said. "This requires the use of natural resources, a use that is sanctioned by Scripture." At the same time, he said, people do not own the land but are responsible for it and will have to answer for how it was cared for. "None of us want to have anything less than clean water; none of us would want to see the Earth, and including of course the landmass of the United States, desecrated in any way," Mohler said. "We also must remember the land was given to us to be enjoyed and to be used, as well as respected and appreciated." Pruitt's schedule at EPA, obtained through a Freedom of Information Act request by E&E News, showed that he went back to the Bible study on two other Wednesday mornings after that first visit on March 15. E&E News couldn't confirm whether Pruitt continued to attend the Bible study. EPA did not respond to numerous requests for comment, and FOIA requests for Pruitt's schedules past March 31 have not yet been returned. Details of the Bible study itself are murky. Capitol Ministries, a nonprofit organization, runs the Cabinet-member Bible study under the guidance of its founder and president, Ralph Drollinger. Capitol Ministries would not confirm which Cabinet members attend its Wednesday Bible study, though it does prominently list the Bible study's sponsors. They include the vice president, Pruitt, Energy Secretary Rick Perry, Housing and Urban Development Secretary Ben Carson, Education Secretary Betsy DeVos, Agriculture Secretary Sonny Perdue, CIA Director Mike Pompeo, Health and Human Services Secretary Tom Price and Attorney General Jeff Sessions. Drollinger, a 63-year-old, 7-foot-1-inch former UCLA basketball player who also had a short stint in the NBA, has found a calling in bringing the word of God to politicians on Capitol Hill. The ministry's website sums up Drollinger's ultimate goal: to "make disciples of Jesus Christ in the political arena throughout the world." Now celebrating 20 years since its founding, Capitol Ministries hosts Bible studies for members of Congress and has ministries in 41 states. Other sponsors include Sens. John Thune (R-S.D.) and Joni Ernst (R-Iowa), Texas Republican Reps. Blake Farenthold and Lamar Smith, and Oklahoma Gov. Mary Fallin (R). According to Freeman of Duke Divinity School, the Master's Seminary in Los Angeles, where Drollinger received his religious training, is known for teaching a more conservative reading of the Bible. John MacArthur, the LA seminary's president and founder, has sermonized against the existence of evolution, and instead says God created plants and animals — in all their diversity — all at once. "When I say Southern Baptists are the religious right, [MacArthur] thinks all Southern Baptists are accommodating secular society," Freeman said. 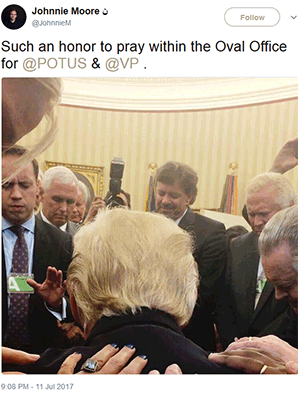 Capitol Ministries also follows a more conservative approach than other evangelicals, according to the Rev. Mitchell Hescox, president and CEO of the Evangelical Environmental Network. The EEN supports strong action on climate change and has come out strongly in support of efforts to control methane emissions from the oil and gas industry. Hescox also wrote a letter to President Trump during Pruitt's confirmation process, urging him to select someone else for the role of EPA administrator. This week, Hescox testified at EPA's open hearing in opposition to the agency's plan to delay implementing New Source Performance Standards for methane emissions for two years. "I know that [Capitol Ministries] have the ear of some people in the administration right now. Their theology is somewhat different from most Evangelical theology," Hescox said. One of Drollinger's Bible studies is called "Coming to Grips With the Religion of Environmentalism." Drollinger turns to Genesis for an explanation. He promotes the idea, popular among some conservatives, that environmentalists have started worshiping God's creation, the planet and all the living organisms on it, instead of God. "The earth is the highest good in their way of thinking, not man; and God is to them a myth, harmless at best but potentially dangerous," he wrote. Instead, Drollinger lays out how the Earth's resources are meant to support the well-being of mankind. "God has placed man in a superior position over the remainder of creation. This is fundamentally important because it forecasts God's intention: that the remainder of creation is to serve man," Drollinger wrote.